Your aquarium fish, as well as their cousins in the ocean, are well acquainted with the tiny microorganisms that help keep home tanks healthy and the ecosystem humming. Phytoplankton can be so tiny they're invisible to the naked eye. They become food not only for aquatic animals but for other plankton as well. Phytoplankton are free-floating aquatic organisms also referred to as microalgae. Like plants, they require sunlight, or an aquarium light source that mimics the sun's rays, to grow. They can range in size from single-celled algae all the way up to hunks of seaweed, though they technically don't have stems and leaves like some other plants. Often found floating in the ocean, phytoplankton contain chlorophyll, and they feast upon nitrates and phosphates to thrive, releasing oxygen in return. They also form the salad portion of the diet for many creatures that inhabit oceans, lakes and fish tanks. Zooplankton such the tiny copepods or amphipods that can be found in marine or freshwater aquariums, and snails, will feed on phytoplankton. In your aquarium's cycle of life, zooplankton often become food for coral and fish. Scavenger zooplankton can be a valuable asset in keeping aquarium algae under control. 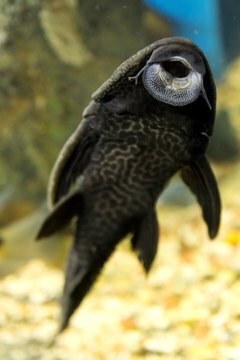 Algae eaters such as the reliable glass-cleaning plecostomus, some catfish and shrimp also feast upon these organisms. If your fish isn't a species that feeds on algae, you'll need to supplement the aquarium environment with appropriate food. In the ocean, phytoplankton are the first course in the food chain. Jellyfish, which are actually large plankton themselves, eat phytoplankton. The microalgae are also nourishment for krill and zooplankton. Fish then get sustenance from the organisms that have fed on the phytoplankton, including baleen whales, which strain the plankton out of the water and into their mouths. Then phytoplankton get nutrients from the feces of whales, helping keep the carbon cycle of the ocean in check. Aquarists recommend that home aquariums contain plankton to help feed captive fish and invertebrates and to contribute to a healthy cycle. Filters may pull these organisms out of the water, but sumps will encourage growth. However, out-of-control growth encouraged by excess nutrients in the water, such as nitrates, can produce a toxic algae bloom. This isn't just an aquarium problem, as the National Centers for Coastal Ocean Science is tasked with tracking algae blooms in open waters and trying to mitigate harmful impacts. According to the NCCOS, algae blooms from hyperactive plankton can block sunlight from reaching plants below the surface, can suffocate fish and can even contaminate seafood eventually consumed by humans. Generally, the blame for phytoplankton explosions goes to things that throw the ecosystem off-kilter, such as pollution and the introduction of invasive species.